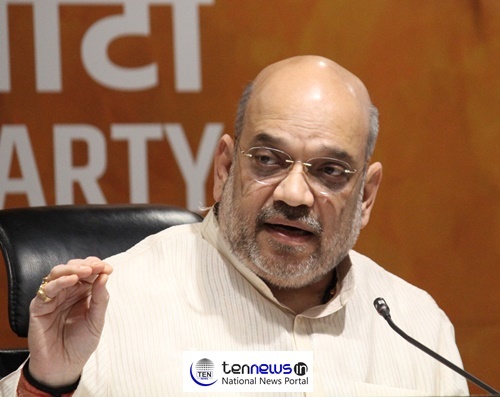 New Delhi: BJP President Amit Shah on Tuesday claimed that BJP government has made 16,850 villages of the country problem free and by August 15, 2018 48,150 villages will also become the same. While addressing media on Tuesday at party office, he said, this is a unique plan by any government since independence to make villages problem free. Under the Gram Swaraj Abhiyan which was observed from April 14 to May 5, 2018 in all 16, 850 villages, seven government schemes such as Pradhan Mantri Ujjwala Yojana, Shoubhagya scheme (Electrifing all villages) Ujala Yojana, PM Jandhan Yojana, PM Jeevan Jyoti Yojana, PM Suraksha Bima Yojana and Mission Indradhanush were given to every household as well as villagers. “This is a unique programme initiated by the BJP government to make Indian villages problem free and provide full benefits of the central government schemes. The campaign has been run by the BJP workers and government officials. Moreover, BJP leaders, MLAs, MP and government officials made huge contribution to make this programme successful and they also spend night there. “By August 15, 2018, the party has targeted to reach more 48,150 villages of the country.” Shah claimed.